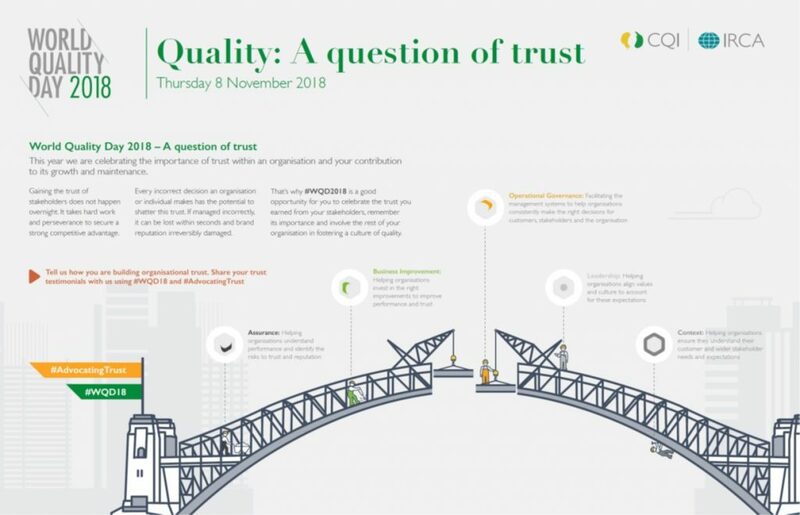 Every year, the Chartered Quality Institute (CQI), along with UKAS and other quality infrastructure partner organisations, celebrates World Quality Day. This year, World Quality Day — part of World Quality Month — falls on Thursday, Nov. 8. As in previous years, it is a chance to reflect on the role quality management plays in all our lives, and the actions we can take, both as individuals and as members of a team, to develop more effective processes, systems and outcomes. As longstanding supporters of standardisation and quality management, UKAS is proud to be a supporter of World Quality Day 2018. Conformity assessment and UKAS accreditation are important parts of the nation’s quality infrastructure. By providing confidence in goods, services, management systems and people, they make a significant contribution to the importance of trust to regulators, businesses and consumers. Further information on how you can support the event can be found on the CQI website.